Will Social Media Marketing Kill your Company…? No denying social media is here to stay – it’s certainly got marketers hot and giddy. And why not – Twitter and the like provide wonderful channels to engage and subtly influence buyers early in the sales cycle. But the reality is, there is only so much marketing budget to go around. And putting too much of it into the social media bucket at the expense of other areas will kill your company. The 2×2 below shows why. The optimal situation for your company is to be in the top right quadrant. That is, both your positioning and marketing messages are well thought through, and your use of social media is strong too. In other words, you’ve defined a great value proposition and you’re simply awesome at getting the word out. Congrats, you’re well placed to coin it in. In the top left quadrant things are not optimal, but still pretty good. In this situation, the messaging and market positioning are still solid, but your use of social media is weaker. That’s still a pretty good position because you inherently have a strong value proposition, it’s just that your ability to get the message out is lacking a bit without better use of social media. Moving down, the lower left quadrant is where things start to seriously unravel. Not only is your messaging poor, but you’re pretty lame at social media too. But, things could be worse – and if you live in the bottom right quadrant, they are! It may be counter-intuitive, but if you’re weak at messaging, yet great at using social media, your situation is actually pretty dire. Here’s why: If you haven’t understood the buyers needs, you can’t build a compelling value proposition. Without a compelling value proposition, there’s no way you can craft messages that are going to appeal to buyers and bring them into the sales funnel. And no amount of social media is going to change that. 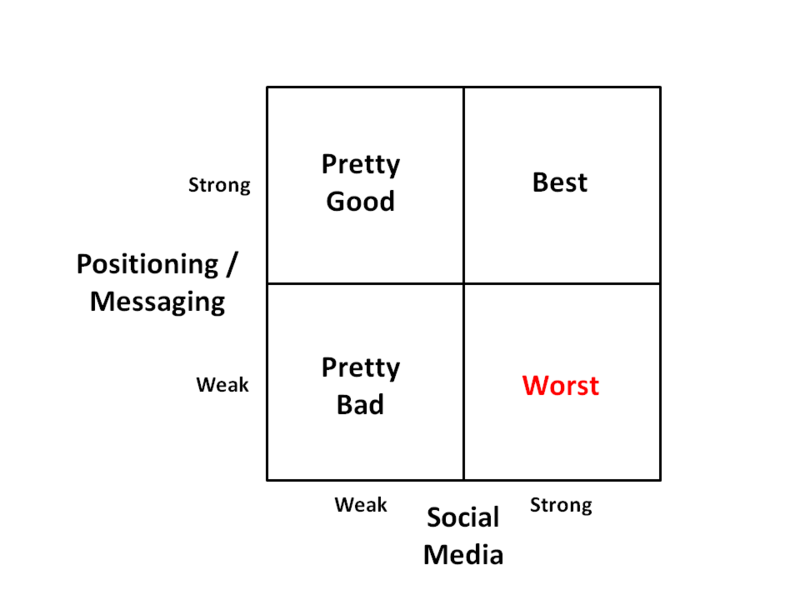 As the 2×2 matrix shows, with good social media skills all you’re doing is getting a bad message into the market very effectively. What better way to kill your company with marketing! Unfortunately, this isn’t as rare as you might think. I’ve seen a couple of examples recently where social media marketers load up with abbreviations and creative hashtags to squeeze every ounce of value out of their tweets. But, when you get to their homepage, the messaging just isn’t right. Don’t get me wrong, you need great social marketers. But equally, you need people who are passionate about positioning and messaging. Every company needs someone who won’t sleep well at night until they’ve found the right 15 words to define their company’s unique value proposition. And then thinks deeply, works collaboratively, and persistently, to build out the messages to support that. ykwim. Industrial IoT: Evolution or Revolution…? Let’s play Clue: Who really killed EMC?